Here are the best food and meal deals for Valentine's Day 2019. Whether you're happily in love, single or really angry at your ex, there's a food deal for you on Thursday. Here are 19 freebies and meal deals national chains are offering on Valentine's Day. Looking for a more unique deal for your loved one? You can always get them a cake made of cheese or an Olive Garden breadstick bouquet — click here for more details — or you can click here and learn how you can treat them to a romantic dinner at Waffle House. FREE CHURROS: Free five-piece mini churros, New York-style cheesecake or regular shake with any purchase from the Jack in the Box mobile app. FREE COFFEE: Buy a regular or larger size beverage, get one free from Coffee Bean. FREE COOKIE: Customers without a significant other can get a free cookie with the purchase of a meal on Thursday at Potbelly. FREE PRETZELS: Buy one heart-shaped pretzel, get one free with this coupon from Auntie Anne's. FREE TACOS: Buy an entree, kiss someone and get a free entree at QDOBA. FREE WINGS: 10 free boneless wings with the purchase of 10 wings at Hooter's when you destroy a photo of an ex-partner in restaurants or online. Boston Market: $5 off a family meal and $29.99 for two prime rib individual meals with these coupons. Valid Thursday only. Buca di Beppo: $49.99 dine-in-only special which includes a heart-shaped lasagna, salad, garlic bread and dessert. While supplies last. California Pizza Kitchen: $35 deal for two, includes two entrees, an appetizer and a dessert. CPK is also selling heart-shaped pizzas. Carrabba's Italian Grill: special meals for two starting at $45. Chili's: $5 Grand Romance margaritas. 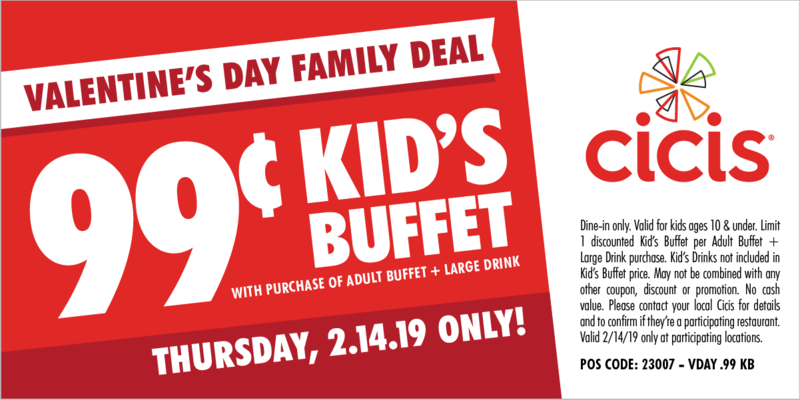 Cici's Pizza: 99 cents kid's buffet. Valid Thursday only. Dunkin' Donuts: Dunkintines can be bought in store while supplies last. Maggiano's Little Italy: $80 meal for two, includes two entrees and beverages as well as an appetizer and dessert. Max & Erma's: $29 Cupid's special, includes two entrees, two appetizers and a dessert. Mrs. Field's: 30 percent off last-minute gifts. Olive Garden: dinner for two to go starting at $35.99. Romano's Macaroni Grill: $45 three-course prix fixe menu for two. Papa John's: $11 heart-shaped pizza ad well as an $80 pizza lover's deal, includes five large one-topping pizzas plus three bread sides and three desserts plus a heart-shaped one-topping pizza. Serves 10-15.